The 2016 election has brought out every emotion known to man. From anger and disgust to joy and surprise. It has unseated seemingly unknown bias’s some didn’t know or think they had. This election has caused some to question a lot of things about what they believe, where they live and what they want the future of our country to look like. For some the emotions they have experienced over the last year will continue and yet for others hopelessness, anxiety and fear will fill their thoughts. As I have thought about the election I’ve come to the conclusion that your life, my life, will be changed. Some of those changes will happen immediately, some will take time. Some changes will be difficult while others will be easier and more enjoyable. 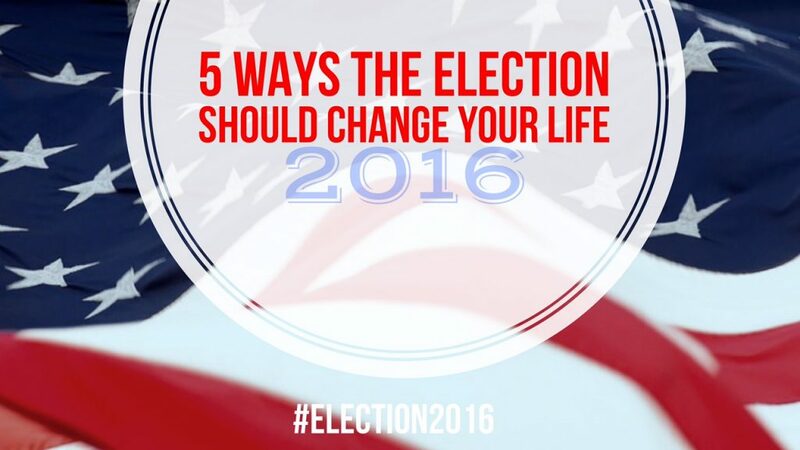 Here are five ways this election should change your life. Each of these require you to take action in spite of whoever leads our country, your city or your state. You are responsible for where you find your place in life. From your career to relationships and health, all of those things are within your control. Don’t blame someone else, the government, circumstances or “bad luck”. Take responsibility for your successes and failures. If things in your life aren’t what you want, take responsibility and make the necessary changes. Understand that change begins with you. If you want to see things change in your community and country begin to show and model what that change looks like. Actions speak louder than words. You play a key role in building bridges and reaching out to others to find common ground. Unity can’t be legislated or demanded by any law or government. Unity is born out of a desire to live in understanding with others. Even when there is disagreement and differing points of view there can be respect, honor and unity. Hard work isn’t dependent on anyone else except you. It doesn’t matter who occupies a public office, you have the opportunity to rise up and carve out your place through hard work. Patience, persistence and perspiration are three things that will get you further than solely relying on your skills. The golden rule has always been the best way and will always be the best way – treat others how you want to be treated. If there is any one thing that you should have walked away with from this election it should be this. If you want to stand out and have a positive impact on those around you, treat them how you want to be treated. There are plenty of people, and maybe you are one, that believe the results of this election will totally upend your life for good or bad. At the end of the day you have the ability and the right to choose how you respond to the results. Your future is in your hands. Take responsibility and let change begin in and with you. Be intentional about building relationships with those who share different beliefs and opinions. Work hard and when you feel like you have worked hard, work harder. And lastly treat others with respect, honor and how you want to be treated.